IBM® FileNet® Content Manager Version 5.2 provides full content lifecycle and extensive document management capabilities for digital content. IBM FileNet Content Manager is tightly integrated with the family of IBM FileNet products based on the IBM FileNet P8 technical platform. IBM FileNet Content Manager serves as the core content management, security management, and storage management engine for the products. 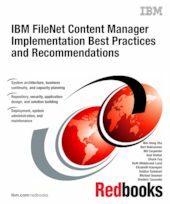 This IBM Redbooks® publication covers the implementation best practices and recommendations for solutions that use IBM FileNet Content Manager. It introduces the functions and features of IBM FileNet Content Manager, common use cases of the product, and a design methodology that provides implementation guidance from requirements analysis through production use of the solution. We address administrative topics of an IBM FileNet Content Manager solution, including deployment, system administration and maintenance, and troubleshooting. Implementation topics include system architecture design with various options for scaling an IBM FileNet Content Manager system, capacity planning, and design of repository design logical structure, security practices, and application design. An important implementation topic is business continuity. We define business continuity, high availability, and disaster recovery concepts and describe options for those when implementing IBM FileNet Content Manager solutions. Many solutions are essentially a combination of information input (ingestion), storage, information processing, and presentation and delivery. We discuss some solution building blocks that designers can combine to build an IBM FileNet Content Manager solution. This book is intended to be used in conjunction with product manuals and online help to provide guidance to architects and designers about implementing IBM FileNet Content Manager solutions. Many of the features and practices described in the book also apply to previous versions of IBM FileNet Content Manager.